So far, the menu has remained relatively similar, beyond some seasonal shifts, but that will evolve. “We envision moving to more of a colonial French as opposed to the current more classical French,” said Melton. “We feel people will be more open to that here on State Street as opposed to across town.” That might mean a bit less frogs’ legs Provençal and a bit more Southeast Asian, African, and perhaps even Louisiana influence. But if you want to see Melton at play, eat from the small-plates menu, which is getting increased attention due to more walk-in traffic and a prominent bar. “It’s my palette for creativity,” he said. “It allows customers to try things they may not be willing to try in larger portions. If I had the time to work a new small-plate menu every day, I would.” Recent highlights included duck confit crêpes and a savory Stilton and lavender “cheesecake” on arugula. 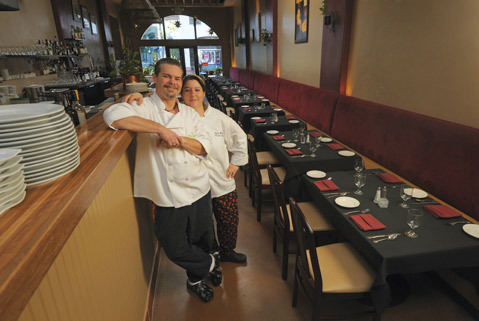 Meander over to Restaurant Mimosa, 714 State Street, (805) 963-2272, or check them out on Facebook.